The media has widely reported Johnny Depp's "adoption into the Comanche Nation." Some thoughts on whether this claim is accurate and what it means. Has Johnny Depp become a real or an honorary member of the Comanche Nation? I'd say "real" if he can vote in tribal elections. Anyone know? This led to a Facebook discussion with a couple of people:He's an "imaginary" member, no?I'm not even sure he's an honorary member. Does Ladonna Harris have the power to bestow any kind of membership on someone? Or is it a pure fiction?Fiction, I imagine.These are the questions the reporters should be asking.No such thing as being adopted by a tribe. An individual Comanche adopted him as an honorary family member.If that's the case, many of the articles are misreporting it.No surprise. It's a persistent urban legend that whites can get adopted by a tribe. Even L. Ron Hubbard claimed it. But you can only be adopted by a person or family.So Depp probably was adopted into Harris's family in a ceremony that has no political or cultural standing. Depp's PR people must be working overtime to get that misreported as an adoption into the Comanche Nation. Does Depp think the "adoption" will shield his portrayal of Tonto from criticism? Did that even enter his mind? I'd love to know the thinking behind this move, and how it came about. Here's another take on the adoption--from writer Gyasi Ross on Facebook:This is just some terrible, corny new agey mumbo jumbo...Jonny Depp has never done anything for Native people and was adopted 100% on the basis of his celebrity status--there's PLENTY of non-Natives that work within Indian Country, there are people with real Native ancestry who aren't members...nobody's rushing out to adopt those folks. We need to stop being groupies and start having some standards about our Nations. Things like this are the reason why people like Elizabeth Warren and Princess Palemoon and all those box checkers feel comfortable saying they're Native--because so many of us treat membership as if it's a popularity contest. Disgusting.Nobody's criticizing Depp? 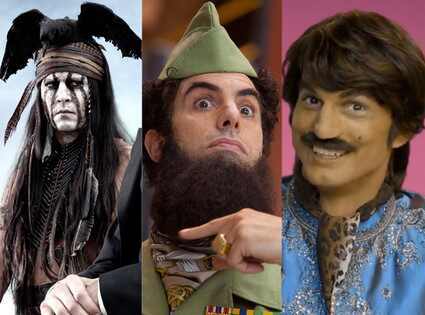 By Leslie GornsteinWhy does Johnny Depp get adopted by the Comanche for his Tonto role while Ashton Kutcher and Sacha Baron Cohen get ripped for their racially charged characters? In fact, Depp has been fielding criticism for months about his upcoming turn as Tonto. His exaggerated Marilyn Manson face paint, the dead bird he wears on his head—none of that has sat particularly well with many Native Americans. That said, yes, Comanche LaDonna Harris did go ahead and ceremonially adopt the 48-year-old actor in her backyard on May 16. Per tradition, Depp was given small gifts, such as pottery, to then redistribute to the people who were honoring him. Harris, who is president of the Americans for Indian Opportunity, told me that she has no worries about Depp's portrayal of Tonto. In fact, just the opposite. "I don't share that concern for one reason," she told this B!tch. "Tonto is a role reversal this time. He's the hero in the movie, the brains. And the sidekick is the white guy, so to speak. "The short answer to the article's question is that Depp is getting plenty of criticism in Indian country. It may be under your radar, but it's there. And one adoption doesn't change it. I had a long discussion with someone on Facebook about Kutcher's playing a stereotypical Asian Indian. I said it was wrong for the same reasons as Depp's playing Tonto. Sacha Baron Cohen's characters are also problematical, but at least he's attempting some serious satire. Harris's comments here are just as ridiculous as calling Depp's portrayal "historic." As I noted before, this take on Tonto is boringly unoriginal. It's noteworthy only if you're ignorant about the Lone Ranger's long history in pop culture. Harris hasn't seen the movie, so she doesn't know if Depp's "role reversal" works. If Tonto is a stereotypical "spirit warrior," it's more of a problem if he's the main character. Tonto as the central character works only if the portrayal is free of mistakes and stereotypes, and that's in grave doubt. Meanwhile, Harris has nothing to say about Depp's fantasy costume, which will influence perceptions regardless of anything else in the movie. So Harris is unconcerned because she doesn't know or care about the main thing that concerns everyone else. Something about an ostrich with its head in the sand comes to mind. For more on the subject, see Depp's Intent Doesn't Excuse Stereotypes and Depp Admits Tonto Costume's Origin. The funny thing about Sacha Baron Cohen is this: He plays an antisemite in Borat, but Cohen himself is Jewish. He's so over-the-top that it's obviously a parody. Depp...I don't know. Even if you think of "retro" as "Yes, I know this is stupid, but I'm doing it ironically. And I know that makes me a hipster, but I'm being a hipster ironically. ", and we all agree Westerns are corny, he still doesn't have the zero degrees of separation that Cohen has. Yet Cohen gets attacked, and Depp doesn't. Say, how about that self-described (*LONE*) "Patriots for American Indians" infamously but virulently known as--David A. Yeagley. Is he an honorary member of the Commanche Nation? I think not. I doubt he is even a "real" member. My best guess is that he is an "imaginary member". Granted. Rob never once found this out. However, he did write briefly about Mr. Yeagley. But never looked into the fact if Yeagley is an official member(as in a "real" member). Now now, don't go against imaginaries. The square root of negative one is sad that you'd compare it to Yeagley. Over on Indianz.com, they looked into it. The only conclusion was that he looked like Michael Jackson.